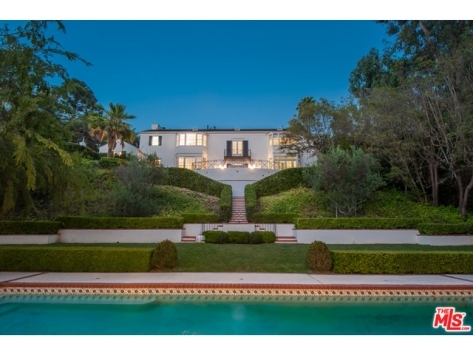 Absolutely gorgeous Classic Traditional Home, designed by well-known architect Ray J. Kieffer, nestled behind gates. This chic 5BD+8BA (incl. 2 powders) home imparts a timeless grace and elegant quality throughout this lovely floor plan. The stylish foyer opens to the step down living room with fireplace, decorative moldings and a large bay window. Entertain with ease in the family room with full bar, built-ins and doors to the patio. The formal dining room flows to the cook's kitchen featuring a sunny breakfast area. Upstairs are 3 generous bedroom suites including the sumptuous master with a luxurious bath. French doors open to the entertainer's patio that overlooks the carefully landscaped grounds leading to the sparkling pool and detached guest house. A second bonus room off the garage could make a great office, gym or studio space. A rare find, this spectacular property enjoys wonderful privacy, views, and expansive motor court, and handsome detailing from top to bottom.